Tangipahoa Parish Sheriff Daniel Edwards proud to announce that the Tangipahoa Parish Sheriff's Office (TPSO) has been reaccredited by the Commission on Accreditation for Law Enforcement Agencies, Inc. We received our formal reaccreditation at a ceremony this past Saturday, July 28, during CALEA's summer conference in Grand Rapids, Michigan. As part of the reaccreditation process, CALEA assessors visited the Sheriff's Office in April for a three-day on-site assessment to examine the department’s policies and procedures, management, operations, and support services related to law enforcement. The CALEA assessors evaluated the TPSO on its compliance with more than 180 standards related to law enforcement. CALEA first accredited the Tangipahoa Parish Sheriff's Office in 2011, and we have been reaccredited every term since then. A huge shout-out to all TPSO team members for their continuous efforts and support! Thank you for all you do! 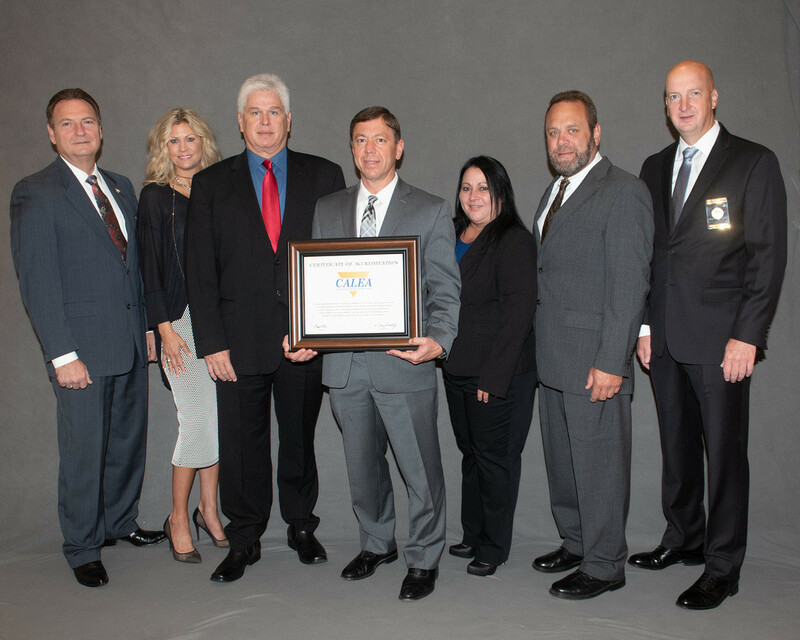 In July of 2015, the Tangipahoa Parish Sheriff’s Office met the requirements of the highly regarded broadly recognized body of Law Enforcement Accreditation standards and was awarded for the first time full accreditation status by the Commission on Accreditation for Law Enforcement Agencies, Inc. (CALEA) on July 25, 2015, in Colorado Springs, Co. at the C.A.L.E.A. summer national conference. After a 3-year self-assessment phase and an on-site inspection of policy, procedures, equipment and facilities by CALEA assessors, Sheriff Edwards and his Accreditation Team attended a hearing before a panel of CALEA Commissioners that made a unanimous vote to recommend accreditation of the Tangipahoa Parish Sheriff’s Office signifying excellence in public safety policy and practice. Accreditation is a voluntary process that invites independent accrediting bodies to inspect and review agency policies and practices to determine if the agency is following state and national standards and best practices. Accreditation is a highly valued recognition for any law enforcement agency. The purpose of the Commission is to develop law enforcement standards and to establish and administer the accreditation process. The accreditation process is how a law enforcement agency demonstrates how they meet professionally recognized criteria for excellence in management and service delivery. “Being CALEA certified is not required, but it does indicate a level of professionalism. We choose to look at ourselves with a microscope to make sure we are doing everything we can do to be a professional and efficient sheriff’s office, especially in the climate we have today in law enforcement,” Edwards said. “We continue to open our agency to scrutiny from outside independent organizations whose job it is to make sure we are adhering to best practices in a wide range of areas, from law enforcement to areas operations to include purchasing, training, and fiscal responsibility,” Sheriff Edwards. The Tangipahoa Parish Sheriff’s Office is one of only four sheriff’s offices in our state to be accredited. There are also four accredited police departments in Louisiana. This accreditation would not have been possible without the support and hard work of the men and women at Tangipahoa Parish Sheriff’s Office. To learn more about the Commission on Accreditation for Law Enforcement Agencies (CALEA) please visit http://CALEA.org.